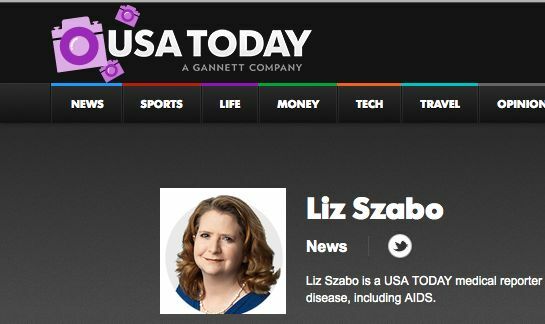 USA Today reporter Liz Szabo breaks news for a living. She doesn’t have time to dig into decades of regulatory records and legal files. But she made time when she received a legal threat from lawyers for a physician -- Stanislaw Burzynski -- even before she had written a single word about him. I wrote last year about why the story that came out of her research was so hard to do. Then, I asked her to provide more details. She did, via email. The first part of the interview is below. Q: There’s been a lot written about Stanley Burzynski going back many years. A lot of reporters might have decided there was no new territory here. What did you see that made you decide there was something new worth pursuing? But I pursued it for two reasons. The first was Burzynski himself. I first wrote about Burzynski very briefly in a cover story about a new book on alternative medicine, which was, as our lawyer described it, a “longish book review.” As part of my routine reporting, I emailed Burzynski for a response to the book, which was not flattering to him. I expected Burzynski to ignore me or decline the interview. Instead, I got an 8-page response from his attorneys, warning us of the dangers of writing about their client. That was a first. I’ve never in my life gotten a legal warning about a story before I’ve even written a word. It was a red flag. Also, it was hard to believe that his lawyer could really whip up a letter like this in 24 hours. It seemed more likely that the lawyer had it on file and was perhaps in the habit of sending legal warnings to journalists. That bugged me. Whenever someone works that hard to keep a story from being published, it’s a pretty good sign that you need to write it. The second and most important reason I pursued the story was that there was actually a news peg. After 16 years of dithering, the FDA actually put the clinical trial on hold, first in July 2012 and then in a broader way in January 2013. The hold was due to a “serious adverse event” in June 2012. This news didn’t become public for nearly a year, however, and it only came to light in the Burzynski Research Institute’s annual report to the Securities and Exchange Commission, filed on May 29, 2013. It’s worth noting here that the first news of the clinical hold came from the SEC, not the FDA, which refused to comment on Burzynski or answer my FOIA requests for information. It was only near the end of my reporting, when I was close to publication, that the FDA publicly acknowledged suspending the trial. Q: How do you even begin to get your arms around a legal and regulatory history like this? Multiple agencies. Multiple jurisdictions. Lawsuits. Investigations. How did you break down and pursue your research? This story was clearly complicated, for all the reasons you mentioned. The time commitment was also daunting. I’m a daily reporter, not a full-time investigative reporter. So I knew I would have to squeeze this investigation into the few hours or minutes between breaking daily news. The amount of material that I had to read and understand was really akin to that of a graduate school course. I started with the SEC filing. I could have written a bare-bones story based on that document alone. But without any details about the adverse event, the story would have lacked a human heart. Given that the FDA clinical hold applied to a pediatric trial, the patient in question was clearly a child. That made the story even more compelling. I tried to use the Freedom of Information Act to request information about the clinical hold, adverse event reports and all correspondence cited in the SEC filing. I got nowhere. The FDA has really tight rules about not disclosing anything about an investigational new drug (one that’s still experimental and not yet approved). So they repeatedly shot me down. I was able to FOIA past inspection reports, which showed a pattern of concern, but still didn’t get to the heart of the story. Finding Burzynski’s patients is actually easier than you might expect. They frequently turn to the media to raise money for care, so newspapers and websites are filled with the names of desperate people trying to raise $100,000 to save their lives, or the lives of a child. There are even bloggers who compile these stories. So with some help, I was able to narrow the patient search to a 6-year-old New Jersey child who died just before the FDA clinical hold was issued. My big break came when someone leaked the key adverse event report to me. That report did not include the child’s name, but it matched the New Jersey boy’s story perfectly. So I tracked down the boy’s parents and asked to meet with them. I showed them the report, which they had never seen. But the unnamed child’s patient ID number matched that of their son, as did the events of his death, so it was clear that it was their son’s death that prompted the clinical hold. I also shared some of the FDA inspections with them. It was the first time that they had heard anything negative about Burzynski, and it took them aback. It was difficult news to share, because I didn’t want to reopen such a painful wound. They were genuinely wonderful people who just wanted to save their kid. In other reporting, I did the usual searches for case files of the Texas Medical Board and lawsuits in state, county and federal court. Getting copies of old FDA inspections, through FOIA, showed that the FDA had documented serious concerns about Burzynski for years, but declined to act. Understanding the bureaucracy of the FDA wasn’t easy, but I was able to find both off-the-record and on-the-record sources to help me make sense of these inspections. Q: Burzynski has a really good defense to all this criticism. If his drugs are hurting people, why hasn’t the FDA or some other agency shut him down? He has won court cases. He has won regulatory fights. Could it be that he’s just a pioneer and that history will smile kindly on him? That’s a possibility. But respected medical authorities have said that proving his drugs’ effectiveness shouldn’t take 36 years. Stay tuned for part 2 of my interview with Szabo on Friday. Should Laws Change to Encourage Doctor to Admit Medical Errors? As you have pointed out, taking on a folk hero is hard. And with Burzynski it had to be done. His supporters in social media are vicious - but this probably just means that they have drunk the kool aid and genuinely believe he's a pioneering cancer genius. He's not. We can see from his missing pseudoprogression, characterising ischaemic necrosis as "cure" and so on that he has as much idea about cancer as any other internist with no proper oncology training. Which is what he is. This is a perfect example of pathological science, a term coined I believe by Irving Langmuir but certainly brought to greater notice by Bob Park i his excellent book "Voodoo Science: the road from foolishness to fraud". In science, including medical science, you are allowed to have wrong ideas. You are allowed to come up with weird conjectures. You're encouraged to test them. What you can't do is allow self-belief to creep in. You have to be skeptical, that's the heart of the scientific method. Also, there are very few "brave mavericks" in good science. Watch James Rothman's Nobel lecture and see how many other scientists paved the way for his discoveries. See how intellectually generous he is in crediting colleagues, teachers, earlier researchers and other influences. Burzynski's arrogance is completely at odds with the conduct of good science. he is surrounded by a cult of personality, and he has long since fallen into the trap of believing his own PR. With Blondlot's n-rays, this was comical if in the end very sad. With Burzynski it's a pressing problem. These are not laboratory instruments or cells in petri dishes, these are children. Sick, desperate children. And Burzynski has made millions from what can only be seen as incredibly cynical manipulation of the system. Burzynski needs to be shut down, but the officials who decided that letting him carry on was less trouble than the public fight, need to answer for that as well. See ScienceBasedMedicine.org for the complete takedown on Burzynski.